Have you seen your website engagement go down? Not sure how to attract new customers and reduce your website’s bounce rate? When you focus on improving the way people interact with your website, you’ll be able to deliver a better user experience, increase website traffic, and grow your business. User interaction on your website provides you the opportunity to collect data about your customers and potential new customers. You can use these data points to make strategic business decisions, as well as improve any part of your website or business that affects your buyer’s journey. If people aren’t interacting with your website that means your site is not providing any value or benefit, which devalues the purpose of your site. However, having a strong online presence means having a strong website. So when creating your site make sure to keep your website visitors’ experience in mind so you can boost website visits, engagement, and improve the user experience. 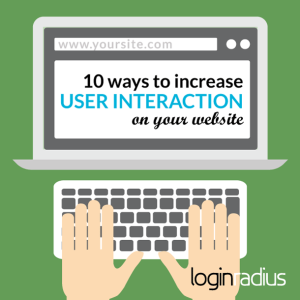 To provide you some guidance, we’ve compiled 10 ways to increase user interaction on your website. If you’re looking to interact with your website visitors, acquire new customers, and decrease your website bounce rate, start with your content. Some may think, why content? But, The content you have on your website can range from blog posts, case studies, videos, and old content. Optimize your content for the search engines. Create content that is written to your practitioner audience. Refresh your old content with new stats, design, and content. Last thing you want is people seeing it was published in 2005 and leaving. Make your content easy to read by breaking up the text. Include images and videos in your blog posts. Use live chat for your website so you can engage with your website visitors, turn them into customers, and, ultimately, gain new loyal fans. Your website visitors’ experience increases exponentially when they can quickly get their questions answered via chat instead of having to call in and wait on hold to speak to a customer service rep. Using chat is cost effective, helps increase sales, and provides you with an abundance amount of user data. The data that chat provides goes beyond just knowing how many chats you receive a day or which representative chatted with which customer. It goes deeper into providing you data about demographics of your website visitors, geographic location, and behavior. All data points that will help you improve your website visitors’ user experience so you can make better business decisions to improve sales and grow your business. Having strong but relevant call to actions on your website will help you grab the attention of your website visitors. 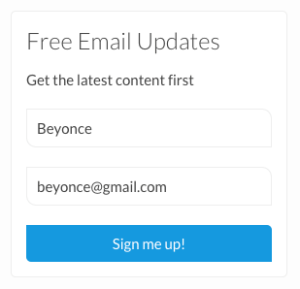 This will help increase user interaction while achieving business goals like: email subscriptions, sales, sign-ups, and so much more. If you need your visitors to take action immediately, and to convert, then using CTAs will allow you to achieve that. However, you can’t just slap a CTA on a button and call it a day, you need to think strategically and creatively to ensure your CTAs is achieving its objective. If you’re writing a headline above the CTA button, optimize them together and make sure they work together. 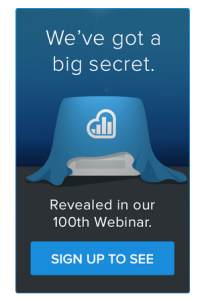 Keep in mind the size of your CTAs because size matters. With mobile usage increasing, it can be quite difficult to click on a CTA that is too small for your thumb. The last thing your website visitor wants is to arrive on a site and have a video all of a sudden start playing while their computer volume is on high and while in a quiet environment. For you, the last thing you want is to have a spike in bounce rates because of people arriving and immediately leaving because they were surprised with a video that started playing out of the blue. By letting the user decide when to play the amazing video you have on your website, you’ll see an increase in user interaction and decrease in bounce rates. Providing a space where your blog readers can engage with you is an excellent way to improve the user experience with your content. Think of a time you read a great blog post and you wanted to applaud the author? Or think of a time where you read a blog post where you thought the author was off their rockers? Wasn’t having the ability to comment and provide your opinion a great experience? Yes, it was. Which is why all bloggers should provide their readers the opportunity to voice their opinion and provide feedback and gratitude through comments. Improving user experience on your website while growing your business all starts by understanding what your customers and potential customers want and what’s preventing them from converting. 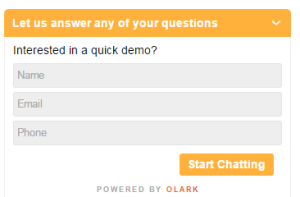 Use tools like Qualaroo makes it easy to uncover critical insights through their website surveys. Ask your website visitors that provides you answers that can improve key business strategies. 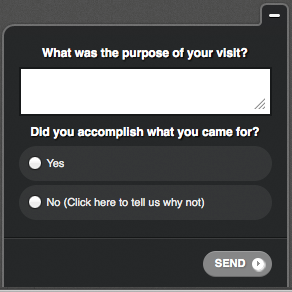 Using these types of surveys on your website can increase user interaction, help you acquire more customers through your website, and decrease bounce rates because they are taking the time to fill out your survey. Pop ups are a controversial topic in the website conversion optimization world. They’re in your face. They’re aggressive and can be quite annoying. So how can they possibly be right for any business? If you have a website goal(s) of increasing user interaction or acquiring new customers, then pop ups can help achieve those goals. These pop ups require your website visitors to interact with your site by engaging with your pop up by either actively saying “No” to your offer or by providing you with their information if you put something irresistible in front of them. Exit pop ups that can be geared towards an offer or a free demo. When designing your website navigation bar, keep it stupid simple (K.I.S.S. ), in other words you need to make your website navigation extremely easy to find and use. Website visitors are impatient and they aren’t going to stay on a website if they have a hard time finding their way around it. Keep your navigation bar consistent throughout your website and title each section in an obvious manner. Using internal company jargon will confuse external visitors, therefore decreasing the potential user interaction your website could gain, as well as new customers your site could acquire. Less is more, don’t over do it on navigation buttons. Put your navigation bar at the top of your website. Remind the user where they are each time they click into a different section of your site. Try to avoid confusion and misdirection at all cost. The relationship you create with your website visitors doesn’t just start and end when they first visit your site, it continues through continuous communication. By providing an option for your website visitors to opt-in to a blog subscription or email newsletter, you’re continuing and strengthening that relationship with customers and new customers who visit your site. The best way to increase user interaction on your website is to increase website visitors. You can do this by allowing your site visitors to do the work of promoting your site to their social circles. Including social sharing tools on your site is the first step to using your website visitor’s network to increase your website traffic. Place social sharing widgets on your blog so your readers can easily share the content they just read to their network. Those visitors who choose to interact with your social sharing buttons are one step closer to becoming loyal fans of your brand and product. Your website is the backbone to your online presence, but your website visitors are the ones who ensures the need for your website. Focus on how you can continuously improve user interaction on your site by testing new opportunities and learning from the data collected through the tools you’ve deployed on your site. Doing this will set your website up to achieve its objectives and serve a purpose to your company’s growth.